In Advent, the liturgy deals with contrasts; light and dark, joy and sorrow, beginning and end, and especially, chronological time and God's time. We discover in Advent that God's time is of the kind described not by clocks and calendars but in terms like "the time is ripe" or "in the fullness of time." Each of the four Advent Sundays has its own particular emphasis, and each reveals the Lord who enters into time and space, into our personal and corporate lives whenever the "right time" occurs. We are led to look forward in anticipation to Christ's return. The First Sunday of Advent is concerned with the Lord's return as Judge of his people and of the whole created order. On the Second Sunday in Advent, John the Baptist is revealed as the Forerunner, the striking figure who fulfills the last prophecies of the Old Testament. He is the human sign that the Messiah has at last come and that God's Kingdom is imminent. On the Third Sunday we hear more of the call to repentance from John and the call to prepare for the Messiah's coming by living lives in keeping with the kingdom of God. We also hear John's testimony to the ministry and significance of Jesus. The Fourth Sunday of Advent is concerned with Jesus' immediate family and particularly with his mother, the Blessed Virgin Mary, and her role in redemption. God brought about the Incarnation of the Son through the cooperation of a human woman with the life-giving Spirit. Furthermore, Mary's vocation is not only to bear the God incarnate, but also to be the pattern for us as we become "God-bearers" by means of following her example of cooperation with divine grace. 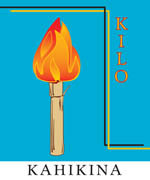 In Hawaiian, "kilo" means stargazer, reader of omens, seer, or astrologer. Like the three wisemen, we watch and eagerly anticipate the coming of the Messiah. Our bamboo torches signify the Light we await.